A rural hub with a pub to service weary travellers, Jambin is on the Burnett Highway just south of Smoky Creek. Part of the Callide Valley, the town is wedged between the Callide Creek to the west and the highway to the east, making it a picturesque spot to stop. Callide Creek is a vital tributary of the Don River, supporting all kinds of farming, cultural and recreational activities. The creek is also a favourite with fishing buffs and well stocked with local varieties including, saratoga, golden perch and yellow belly. 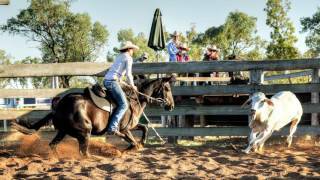 Working Dog Trials in June and the Champagne Campdraft in September head the billing of local events. The Events section of this guide has all the details.